a computer can get awfully bored when it can’t communicate! So unless you’d prefer to have your computer sitting around cooling its chips, we’d strongly suggest you buy a couple of peripherals from Heath. Why us? Because we make peripheral kits. In fact, they’re some of the best around. Our H9 is an excellent example. Its a complete ASCII keyboard/12″ CRT terminal that was designed for hobbyists just like you. It has a lot of really great features and resolution that’s just beautiful. Right on out to 80 characters per line. (Something most outboard TV monitors won’t match!) And with built-in selectable interfacing options, the H9 will “converse” with just about any computer going! The H10 is another of our “universal” peripheral kits. Completely self-contained (it even has its own power supply), this rugged paper tape reader/punch gives you quick, convenient mass storage and internal tape duplicatior capability It’s easy to build and, with its heavy-duty stepper motor, sensitive Darlington photo transistors and precision punches, the H10 is a source of re liable data loading and storage – time after time. Best of all, priced at $530 and $350 respectively,* the H9 and H10 kits cost less than most other comparable peripherals on the market today! A computer can get awfully bored when it can’t communicate. Start communicating with yours through an economical peripheral from Heath! Mail order, FOB. Benton Harbor, Michigan, Retail prices slightly higher. “It has a lot of really great features”, none of which we’re going to list. That’s worth $1795* right there! Way to sell it, guys. IT didn’t come with a monitor or keyboard AND WE LIKED IT! Half a mile to a mile of tape was about $10, fanfold or reel. Less in quantity. You could get mylar tape for really important, often used programs once they were debugged. “Boot tapes” were commonly used in the era, and were almost alway mylar, for example. You shouldn’t anthropomorphize computers. They hate when you do that. I loved Heathkits. While never cheap, they were the best designed and of the highest quality. I still have many Heathkit products that I still use today. I still have my ET-18 HERO Robot. It’s just not practical for people to still build kits today. Too bad. 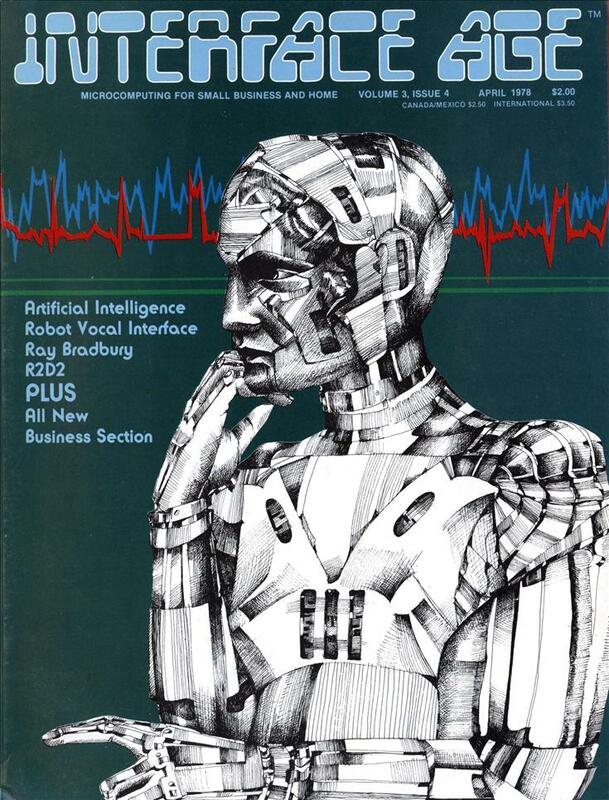 I still remember using a REMEX Paper tape reader and Punch on a DEC PDP 11-04 Mini Computer. This was the late 1970’s. The punch made great confetti. 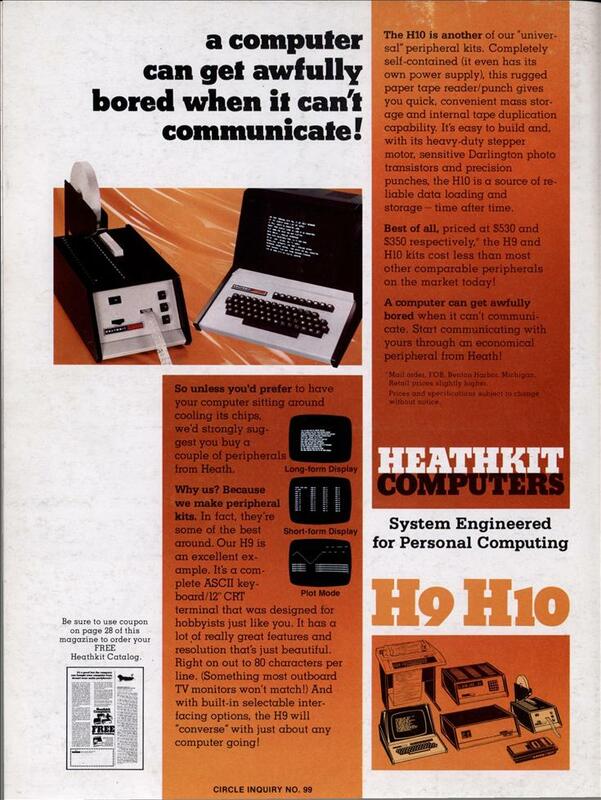 @carlm: I’m shaking a jealous fist at you -grin-; I always wanted a HeathKit Hero, but never got one, and now I can’t afford the few that come up on Ebay. Closest I have managed (so far) has been finding and purchasing a Hero Jr. at a thrift store (advertised on craigslist, no less).